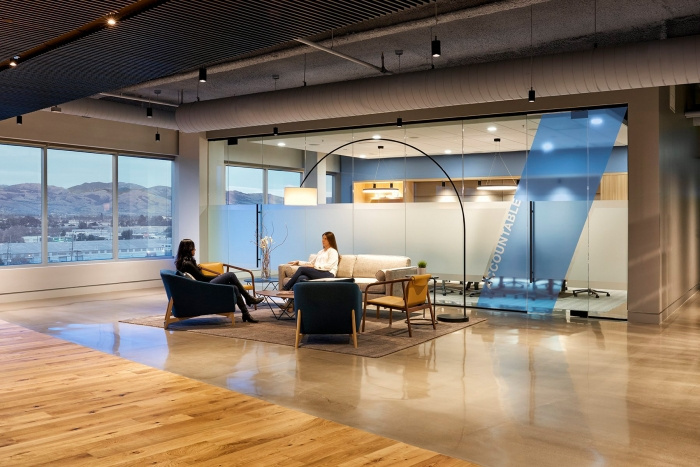 AP+I Design have designed the offices for growing banking company Avidbank, located in San Jose, California. The Challenge – While banking is rapidly transforming from the days of iron vaults to the security of digital identification, Avidbank sought an opportunity to transform their workplace. With three branches in the Bay Area, merging the Palo Alto with the San Jose location was strategic for growth. Their previous environment wasn’t conducive to team collaboration, so Avidbank wanted to create a more open and transparent space providing the opportunity for their employees to experience a different way of working. Additionally, the employee tenure at both locations was quite long, so the success of the workplace merge was crucial to Avidbank’s retention and future growth. 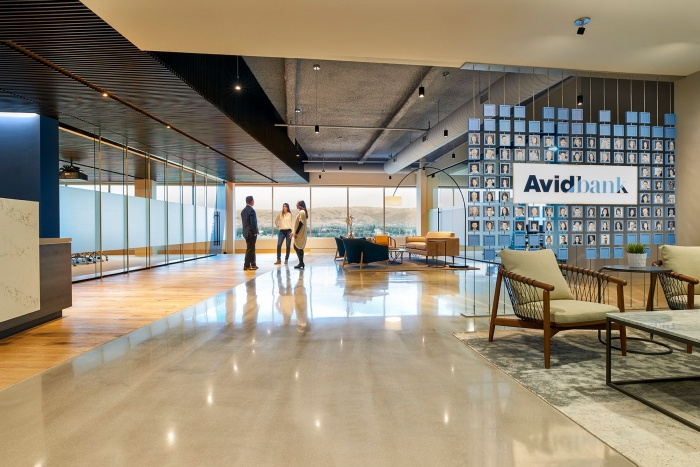 The Solution – Taking a cue from the local community, Avidbank drew inspiration for their space from the innovative environments of their Silicon Valley customers. With input from their employees and guidance from the AP+I design team, the tenets “tailored, transparent + open” became the guiding principles of the “unbank” design concept for the new office. Occupying the top floor of a 6-story building established a presence and provided incredible views which were captured in the large conference rooms and general workspace. Clean lines and a minimal color palette highlighted the architecture and seamlessly incorporated the open workstations. The Avidbank brand was reflected in the architecture through angled glass walls, specialty ceilings, and dynamic graphics that set the tone for next generation banking.